On July 13, 2017, Mason and DJ Nonaka jumped on their grandpa's boat, Nancy Lee, to do some boogie board "water-skiing" behind the boat. After that, they headed for C-buoy outside of HMnaunau, HI. Their grandfather, Steve Arrington, had caught a 152-lb yellow fin 'ahi a few days prior and thought that the buoy was still holding fish. The afternoon bite was on as Grandpa, the boys, and their father, Dylan Nonaka brought in seven 20-30 pound 'ahi. As they were clearing the lines, they realized that they had hooked this 1.42 lb. pilot fish on the 200 lb. test line. 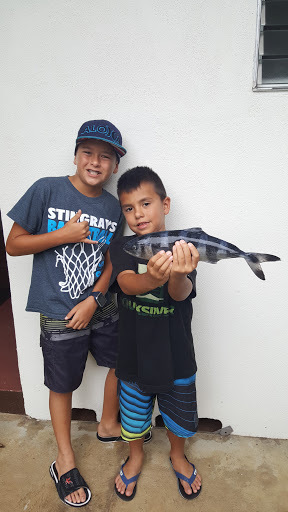 It didn't put up much fight as they were using the big Shimano 130 electric reels, but the boys thought it was cool to hook such an interesting fish. Their smiles grew as they took the fish into the meat department at ChoiceMart to see the actual weight! It was definitely a memorable day on the water for DJ & Mason.